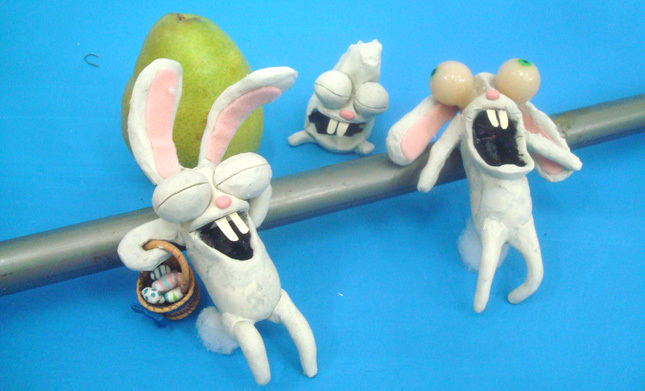 As we roll into Easter weekend, here is an up-close look at the clay bunnies we created for our stop-motion piece, with a pear for size reference. We like to stay healthy. The ears and arms were reused for the squished version of the bunny, while the eyes had to be molded to bug out when he was eventually taken away. Teeth are little painted strips of paper and the eggs are meticulously painted little specks of clay. Happy Easter everyone! This entry was written by paulhanges and posted on April 2, 2010 at 4:06 pm and filed under Production Art. Bookmark the permalink. Follow any comments here with the RSS feed for this post. Trackbacks are closed, but you can post a comment.